Alexandria, VA — Feminists for Life of America has just released Recommendations for Best Practices at Colleges and Universities Serving Pregnant and Parenting Students. During the first Forum, Ms. Foster led a panel of key stakeholders, including both school administrators and those of an off-campus maternity home started by GU alumni to serve economically challenged women in a poor section of Washington, D.C. First, they heard a letter from a pregnant student who was unable to find the support she needed. The audience participated as the moderator helped the panel identify resources on and off campus as well as areas of improvement. They presented a blueprint for progress to the Board of Trustees, who supported the measure. Over the years, they have built a child care center, established housing, expanded resources and information for pregnant students, and held a Forum with FFL every year after. Since then, FFL moderators have led similar Forums at women’s colleges; state schools; and private, Catholic, and Christian universities and colleges across the country. The recommendations, which are a new component of FFL’s Tools for Schools, include policies, model resources and support, and communication strategies. In 2008, FFL released “Perception is Reality,” documenting the impression students have that they cannot complete their education if pregnant or parenting. Earlier, FFL’s efforts on campus inspired the Pregnancy Assistance Fund, administered by the U.S. Department of Health and Human Services providing grants to states and tribes. 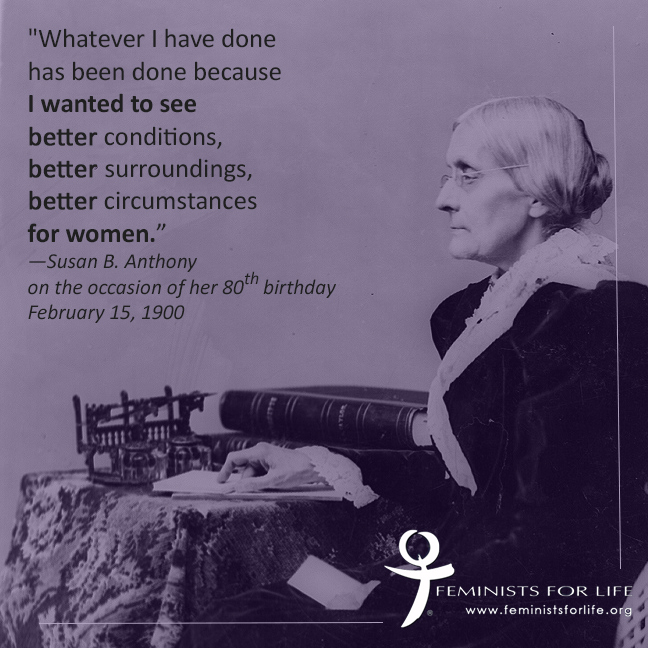 FFL released the study on Susan B. Anthony’s birthday. “We felt this was the best way to honor Anthony, who wrote on the occasion of her 80th birthday in 1900, ‘What I have done has been done because I wanted to see better conditions, better surroundings, better circumstances for women. '” said Foster, who is the creator of the Women Deserve Better® campaign. “Anthony was a champion for mothers and women in higher education. She and Sarah Norton successfully advocated Cornell University to admit women. Today, we know from our own experience working with students and administrators, our work is far from over.” The Institute for Women’s Policy Research reported the urgent need for resources and support in the fall, especially for mothers of color who are at highest risk for dropping out of college. Last year, Feminists for Life unveiled a new online resource, WomenDeserveBetter.com, to help women WORK, LEARN, LIVE, and LOVE better. Administrators and student groups interested in bringing an FFL moderator to campus to hold an FFL Pregnancy Resource Forum, or for an updated FFL Pregnancy and Parenting Resource Survey(SM) and technical assistance, should contact info@feministsforlife.org.